The Basque separatist group Eta has formally acknowledged it carried out a bomb attack that killed two people at Madrid airport last week. However the statement by the group also said that the "permanent ceasefire" announced in March remained in effect. In response, Spanish Interior Minister Alfredo Perez Rubalcaba said he could not see how the nine-month-old peace process could resume. After the 30 December bombing he said dialogue with Eta was "finished". The group's latest statement was sent to the Basque pro-independence Gara newspaper. The paper said: "Eta affirms that the permanent ceasefire started on 24 March, 2006 still stands. It claims responsibility for the attack at Barajas (airport)." Gara also quoted the separatist group as saying: "The aim of this armed attack was not to cause victims." Eta said it had given advance warning of the attack and condemned the fact that the targeted building had not been evacuated. The statement came after two suspected Eta militants were arrested in neighbouring France. Last week, Spanish police discovered two caches of bomb-making equipment and explosives in the Basque country. Officials said 100kg of explosives were found on Thursday, ready to be used in a bomb, and a smaller stash was discovered nearby on Friday. 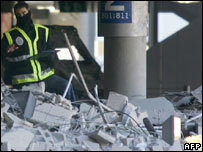 They have not linked the weapons directly with the Madrid blast, which flattened a five-storey building. The two deaths at the airport were the first attributed to Eta in more than three years. The group is seeking an independent state in northern Spain and south-west France.